Teri finds the first couple of mountain black morels. This is perhaps our earliest foray ever for the dark, elusive morels of the Cascades. We are rewarded as we find very fresh examples. The black morels of the high Cascades have begun showing. Teri found the first pair along an old logging road. We had inspected the same location last weekend and found not a one. Needless to say all those we found today were very fresh. We spent a little time trout fishing and as we found a week early, the fish were not on the bite. The water seems to be just to cold. They are there! The high mountain black morel fungi. We drove up a little earlier this year than in prior seasons. Just a hunch based on this Springs weather, and after evaluating last year’s mushroom foray records. The weekend just happened to coincide with the opening of trout season, but did not get to fish much as most of the morning was taken up with leg work on the damp mountain sides. A five point blacktail buck relaxing on an off day. He was with an nearly equal four point buddy. Blacktail deer are one of Oregon’s most challenging and popular big game animals. The general rifle season runs from the warm, dry, noisy days of late September through the increasing wet, cold and silence of early November. To the uninitiated, a month plus of hunting days seems a guarantee of success. Such is just not the case. In the mountains the wild blacktail buck challenges in degree of difficulty to hunt. In the wild environment the blacktail deer are very wary and secretive. They favor steep, clearcut logging areas near timbered hillsides. Most of the time they rarely leave the brush except at night or low light. Smaller than an elk or mule deer, the dark blacktail is difficult to spot. The ability to freeze and hide when a hunter is close by is legendary. When he has to run it is usually with a wheeze, a quick escape into the timber and he’s gone from sight. I like to begin my pre-season scouting early in September. That is when the upland bird hunting season for quail and grouse begins. Migratory banded tail pidgeon season opens mid-month. The bird seasons give me an opportunity to hike and observe the blacktail mountains. If I’m lucky I might even catch a glimpse of a nice buck in his summer haunt. I remember once in August when for some reason I was up there walking along a familar old logging road. A little movement ahead brought me to a halt. From my crouched position I observed six bucks cross the trail ahead one after another. The last one to cross over was a beauty with eye guards and four antler points on each side. I’m not always so lucking to see the mountain, blacktail deer during preseason scouting. What I can find are the signs of activity. Deer bed areas tell where they have been spending summer rest times. Browse that has been eaten down is a good indicator of a hot area. So is seeing a lot of deer droppings. Deer tracks and trails are not always so apparent in the early fall. The ground is hard and dry. The hood prints don’t show up well. Find a good trail wore with lots of hoof tracks and you may have located a good spot to watch on opening morning. Particularly if this traffic path leads from the feeding areas of the open hillsides to the shelter and safety of the timber. Then you might be fortunate to see a group of bachelor bucks moving leisurely downridge at first light. You have my word on that. Logging roads and terrain make for top-notch blacktailed deer habitat. In this location there were six beds in close proximity. Burnt slash at the top of a logging tract. Heavy cover. Just another aspect of the blacktail buck puzzle. Mountain quail found along an old log road. The high blacktail deer haunts can be hard on the feet. An old open cut, full of mountain elderberry. A favorite of the band-tail pidgeons. Band-tail pidgeon season offers an excellent opportunity to scout. Also the chance for delectable table fare. Early Fall fruit of the blacktail deer mountains. This accipiter hawk had a nice view. No doubt was looking for a pidgeon to catch. Looking out towards the deer beds. This was a one hundred yard and some shot across the canyon. Due to the terrain, one shot was enough to tell if the rifle was shooting on or not. Early preparation and scouting pay off. The rifle was shooting straight as a 200 yard plus shot was necessary. Fishing buddy Erik started his hunting late this season. Better late than never! We finally got it done, Erik’s deer on the last day of the season. Posing with Erik’s buck. Helping a new hunter is a real satisfying experience. A one hundred and five yard shot was just the beginning of the work on this wooded hillside. The shaggy mane mushrooms came late this year. This is the first one I found during late November while quail hunting up in the blacktail hills. There is only one thing to do with the the mild shaggy mane mushroom, make an delectable Shaggy Mane Mushroom Soup. So many good things you can do with venison burger. Delicious lasagna is high on the list. One for the Mystery Travel-Pack Rod. Seven feet of fiberglass "stealth rod." Packing along the little “stealth rod” on mountain drives over to the Klamath River sure comes in handy. 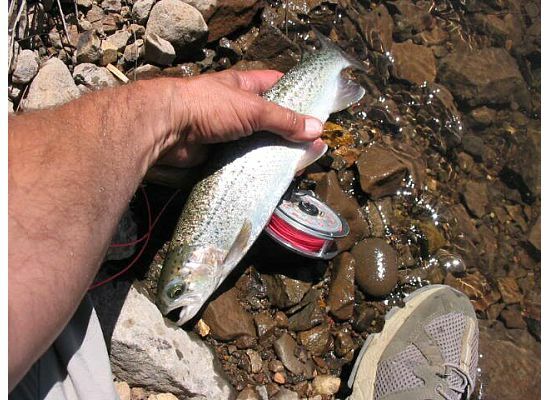 A brief stop to fish a little mountain tributary invariably results in a hookup with a fiesty Klamath River system redside trout. This one took a Zug Bug Nymph. Tried to get away by jumping a record number of times. The fight and spirit in these high mountain, cold water redbands always leaves me in wonder. 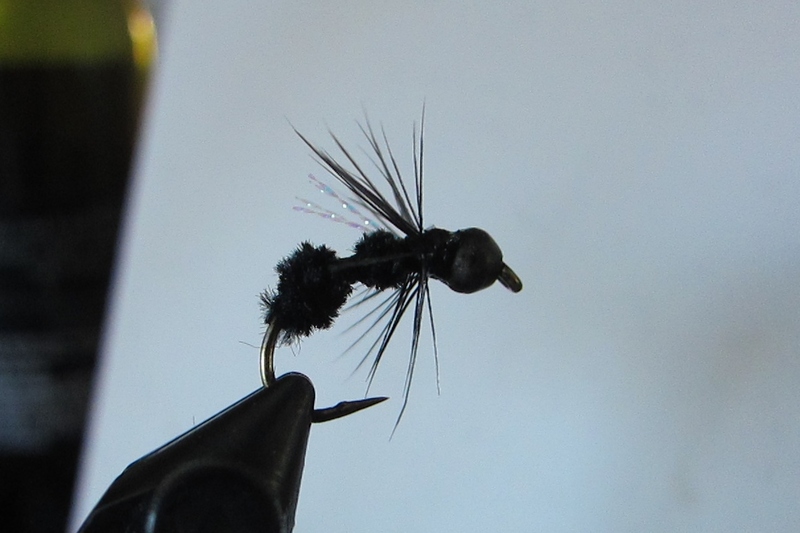 Definitely the next best thing to the fight of a summer steelhead. I found this flyrod just the other day. It was hidden in it’s carry case and resting on a dust covered display shelf that held a jumble of old spinning reels. “What’s in the little rod case?” I asked the rusty, little antique shop’s proprietor. He dug under a couple old Garcia Mitchell reels and handed me the dark case. I opened it and fell immediately in love. The metal ferrules like new silver shined. The reel seat like pure gold glowed. I noted the clear, exact and laquered red windings. I told the shop owner I’d have to assemble and wave the rod around. I lubed the ferrules with the oil from the sides of my nose. I knew already that this rod was going to be mine. 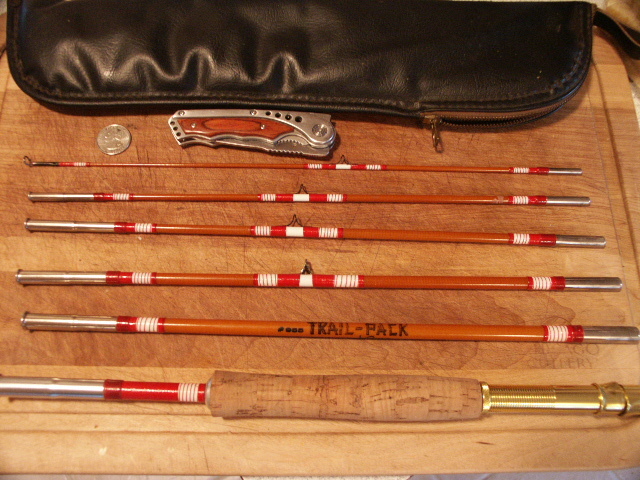 A six piece pack fly rod. Each piece is 15 inchs. Overall rod length is 7 feet. Cast a 7 weight fly line nicely. I’ve already put the rod into action. On a recent drive over the Cascade Mountains to the Klamath River I stopped and flyfished a secret spot. 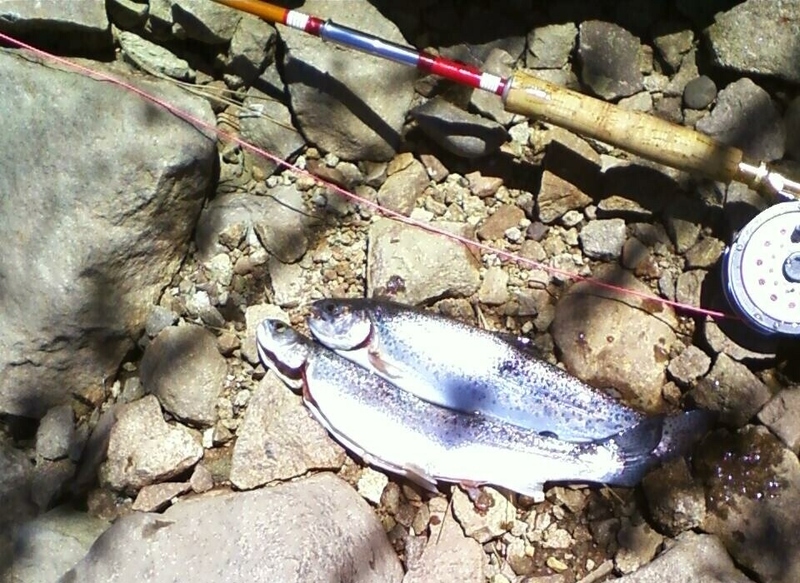 Under a mid-day sun I hooked and landed two redband trout of the Klamath River system. The flyrod preformed well, casting a weighted Wooly Worm with ease, and handling the hard-pulling redbands with sensitivity and control. A great first catch for the new flyrod. A fitting match for the Trail-Pack Rod. I anyone has any information on the Longfellow flyrods would you please share. I found very little information on the internet. A friend said that his father once owned a Longfellow two piece flyrod. That is all I know. Any information or stories would be appreciated.